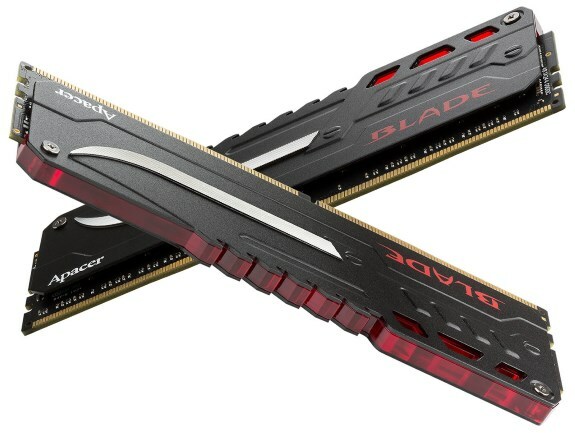 Apacer is pleased to announce its groundbreaking achievement in DDR history, BLADE FIRE DDR4 with heartbeat LED, perfectly for gaming, overclocking, and M.O.D enthusiasts. It is astonishing to see speed at 3200 MHz with LED pulsing at 44 beats per minute yet it is still consuming low voltage at 1.35V. It is compatible with Intel Z170 platforms, providing unprecedented performance and energy-saving efficiency. Backed by the world's best technology in industrial memory module and storage, BLADE FIRE DDR4 makes users on fire in the gaming/ overclocking star-war. The world-class BLADE FIRE DDR4 is an advanced generation of Blade DDR4 which was published in Feb 2015, featured a sensational armory design on heat spreader as well as LED lights heartbeat effect. The meticulously screened ICs allow the optimized stability and compatibility while playing in the heavy workload games. BLADE FIRE is available in 4 GB, 8 GB, and 16 GB capacities in dual-module package and comes equipped with total capacity of 32 GB (16 GB x2). The fastest memory kit available is clocked at 3200 MHz, and BLADE FIRE kits are ranged in four different clock speeds from 2400 MHz 1.2V to 3200 MHz 1.35V with 16-16-18-38. The XMP 2.0 support for simple overclocking setup delivers instant top-level performance for motherboards with Intel's 100 Series. Not only low latency for outstanding DDR4 performance but also lower power consumption with less heat and higher reliability provides users the fastest speeds and the highest stability when it comes to gaming and overclocking. The heartbeat LED on top edge of the module undoubtedly brings out the spirit of BLADE FIRE, to win and shine powerfully on battlefield as every beat embodies the enhancing HP(health point). The four modules altogether on motherboard show various LED light patterns, just like a battling saber on fire in the battleground. The design truly adds some serious bling which offers the users gimmicks to show off while meeting their needs with respect to exceptional functionality. When speaking of the design of BLADE FIRE, the black heat spreader is made from quality aluminum material with matte finish. The metallic silver saber in the middle shows an aggressive look of a gaming memory module. On top edge the serration part of a saber as well as shank at the rear displays an asymmetrical design which presenting an extreme aesthetics. With distinguished speed and stability as well as a stylish design of LED light saber on motherboard, BLADE FIRE allows users to experience the most enjoyable and exciting game play ever. If you're looking for the fastest and coolest memory module available, BLADE FIRE is the one and only you have to look at. Feel the supremacy and prominence of Apacer BLADE FIRE.